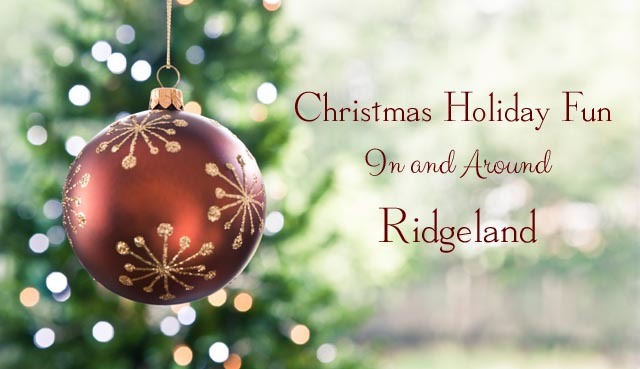 The holidays are finally here and we’ve got some great celebrations in and around Ridgeland to put you into the Christmas spirit. So make your list and check it twice for these nice special events during this special time of year! Bring your fur babies for cute pics with the big guy in red! For more information, visit Northpark Mall on Facebook. The new holiday event in Ridgeland will feature photos with Santa, music from local choirs and bands, food, crafts, and specials from many of the local merchants located in Olde Towne Ridgeland. Bring the whole family and enjoy the fun and learn all about the history of Ridgeland. For more information, visit City of Ridgeland. It’s a big big celebration with face painting, all kinds of sweets and treats, and great sales at The Township’s stores. For more information, visit Township at Colony Park. The snow will be falling in Renasant Bank’s lobby at The Township at Colony Park just in time for your special pic with jolly ol’ St. Nick. Photography by Lisa Reams. (4×6 photos printed on site $10, digital package with 3-5 poses emailed to you with photographer’s release $25) For more information, visit The Township at Colony Park on Facebook. A holiday tradition in central Mississippi for more than four decades and this year proves to be no exception. The festival features over 150 booths representing some of the finest traditional and modern artisans who handcraft items in clay, wood, metal, glass, fiber, jewelry, leather, and mixed media. Meet the artists and shop for that someone special on your gift list. Tickets are $10 per person. For more information, visit Craftsmen’s Guild of Mississippi. Half marathon, kids fun run, 10K run, 5K run, and 5K walk all for a good cause…the Children’s Mississippi Cancer Center. Register online at raceroster.com or southernagcredit.com. Chef John Folse and Chef Rick Tramonto present their annual Christmas Cooking Class which includes a six-course array of game and other dishes as well as Christmas cheer with all the trimmings for the holiday table. Cost for class is $75 per person, plus tax and gratuity. For tickets/reservations, call (601) 853-3474 or visit Seafood R’evolution. The Annual Ridgeland Christmas Parade will begin at Holmes Community College. You’re sure to get into the holiday spirit when you hear a performance of your favorite holiday classics by local church and school choirs. For more information, visit Northpark Mall on Facebook. Enjoy free live music, holiday decorations, and traditional treats at the twenty-third annual Christmas by Candlelight Tour. This year seven sites will be open and sporting holiday decorations—the State Capitol, Mississippi Governor’s Mansion, Old Capitol Museum Manship House Museum, and Eudora Welty House and Garden, plus the new Museum of Mississippi History and Mississippi Civil Rights Museum. For the first time, the Two Mississippi Museums will host the popular small town exhibit of Possum Ridge and its model trains. The Mississippi Museum Store will be open and have a wide selection of Christmas, Hanukkah, and Kwanzaa items for sale. Park and take advantage of the shuttle buses running between sites or drive your vehicle and come and go on your own schedule. For more information, visit Christmas Candlelight Tour. Over 700 volunteers bring this cherished tradition to audiences each year. Some performances are already sold out. For tickets and info, visit Carols by Candlelight. Enjoy cinnabon rolls, coffee and juice with the big guy in red in the mall’s Center Court at the Santa set. For more info, visit Northpark Mall on Facebook. Presented by Velovit, the TBC Mixed Surface Mixer will feature three different cycling routes and Santa at the post ride party! Enjoy waffles and Chick-Fil-A, beer, eggnog, sodas and more. Bring $10 to cover ride insurance. For more info, visit The Bike Crossing. Featuring Kathy Thibodeaux as the Snow Queen, and inspired by the Hans Christian Andersen classic, The Return of Snow Queen fantastically dips into the beauty of storytelling through the art of dance. The audience is taken on a journey with a young girl who fearlessly faces the fury of the Snow Queen with boldness, bravery and love. This fast moving production stands strong on the cast of 75 professional dancers, enhanced by powerful choreography, creative costuming and bigger-than-life sets and scenery. A service of Lessons and Carols Service with full choir and symphony orchestra. A beloved area seasonal event for almost fifty years, the service features beautiful settings of familiar carols along with inspiring new settings of Christmas texts that are fresh and melodious. Modeled after the world-famous Lessons and Carols Service of Kings College, Cambridge, England, the service is appreciated for its spirit of reverence and joy. The event is free with no ticket required. All are encouraged to arrive a bit early to allow time for parking and locating seating. There is a nursery for babies and small children. For more information, visit 1st Presbyterian Church Jackson. Visit the historic Madison County Courthouse Square decorated in over 200,000 lights for this festival that includes carousel rides, horse and buggy rides, train and firetruck rides, photos with Santa, and more! Light and Character Parades will be held at 6:30 and 8 pm on Friday and Saturday nights. For more information, call (601) 859-1307 or visit Canton Tourism. It’s a North Pole adventure at the Mississippi Children’s Museum this holiday season. Meet the train conductor as you climb aboard Santa’s Steam Engine and enter a magical winter village filled with twinkling lights. Race down the 45-foot tall thrilling Snowflake Slide. Old St. Nick himself will be around for photos on Saturdays between 10 am and 2 pm. There’s also Gingerbread House Workshops available. For more info and tickets, call (601) 981-5469 or visit mschildrensmuseum.org.